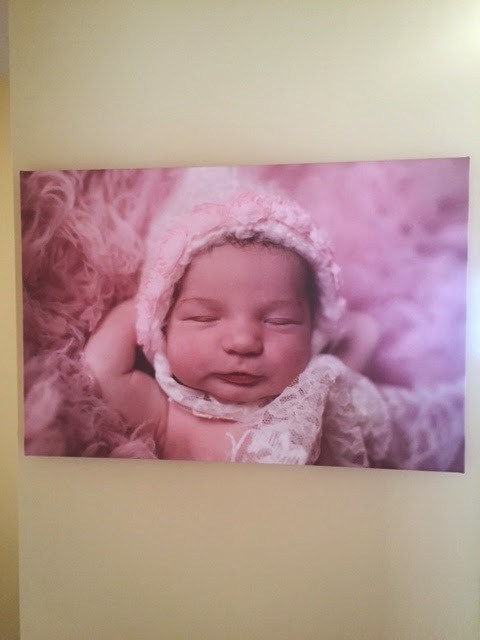 Giveaway – 16×20 Canvas from CanvasPop! As you may know, I love pictures. TONS of pictures. If you’ve been to my house, it’s like a shrine of my little family and Miss H. One decision I made before she arrived last year was to document her newborn photos and 1 year photos with a great photographer. We did that. We ended up getting a package with a huge print of her and for the life of me could not find a frame that looked good. So I settled and ended up putting it in a non-matted frame and a year passed. I was then recently contacted by CanvasPop about learning more about what offer and thought what a wonderful opportunity to fix that eyesore on the wall. Well, it’s not really an eyesore, it’s just not how I want it to look. I had considered a canvas print a while back, but just lost track of time. Ordering from CanvasPop is really simple, upload your image select the size you’re looking for and tada – you’re off and running. 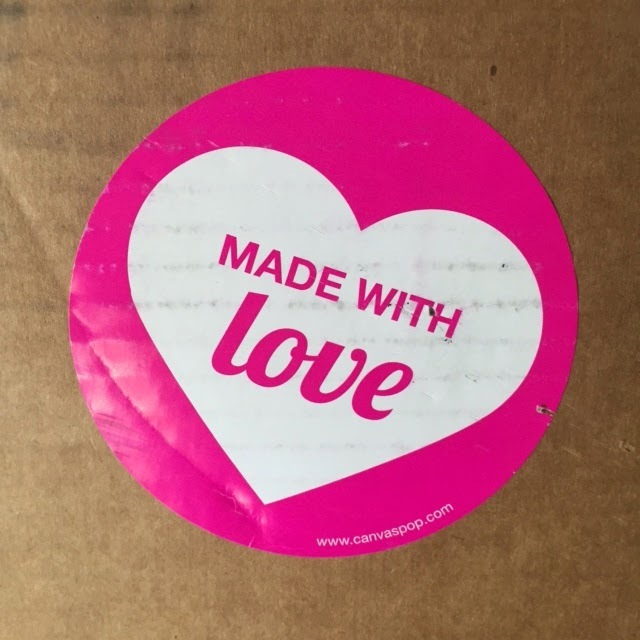 Shipping was really fast and packaged with love. When I opened it up, it was bubble wrapped and gorgeous! They even added a special touch of adding plastic bumpers to the back so it won’t mess up the wall when you hang it. It even comes with a bracket and nail so you don’t even have to go looking for one! Now if they would just send someone to hang it up – I’d be set to go! Luckily I have a handy husband who was able to get it up on the wall pretty easily! If you’re like me and want to order another, CanvasPop has offered And Hattie Makes Three readers a 35% discount! Be sure to use code AHMT35OFF at check out! I’m so convinced you’ll like CanvasPop too that they are giving away a free 16×20 canvas to one lucky AHM3 Reader! There are many ways to enter. Open to US Entries only. Contest ends March 30th. I’d love to know what you would want a canvas of in your home? Awwww, that turned out just gorgeous! Where did you hang it? I could totally get a newborn pic of Baby-Brink (due in July) on a canvas! That would be much easier than going through the poster process and framing. Plus, I wouldn't have to worry about it falling on the babe. Is it super sad that I have ZERO pics of my two babes hanging up in the house? Clearly I need this as a center piece for my living room. id get a photo of my two doggies! I have been meaning to get a canvas printed of the boys! I would probably frame a photo of my kids. I'm pregnant with my first baby so I will either get maternity picture on this canvas or a picture of my baby when it arrives! I seriously love canvases! They add the best touch to any house. I would do one of my Grandkids. I would love a canvas print of my little one. canvas looks so clean and modern. I would make a canvas print of either my two boys or a wedding picture! Something really important, for sure. Thanks for the giveaway! Just so you know, I think you have the wrong twitter handle on the "Follow @AndHattieMakesThree" entry option! I would love a canvas of my 2 little boys. Thanks for the chance of winning one. Who doesn't love canvas photos! Great giveaway :). I'd love to have an awesome, loving, family piece in our living room or son's room. I'd use a picture of my son playing soccer. I would love a picture of my daughter! I live in northern New Hampshire and I have some beautiful foliage pictures to choose from. I would frame a family photo of my kids and grandkids. I'd get a picture of my kids to give to my dad.